Neo, the prophesied savior of blah blah blah etc. Much less whiny and unsure than before– paradoxically, this is because, not in spite, of the phony reveal from the Oracle that he’s not The One. Since destiny was not going to make him an amazing hero, he had to make himself one… and Morpheus’ capture necessitated him getting to that lickety split. Played by Keanu Reeves. Agent Smith, leader of the Matrix’s evil Agent trio. Even without backup he’s more than sufficient to be a deadly threat, as we learned last time. Armed with: also a handgun. The Setup: Neo & Trinity have successfully saved Morpheus from capture/interrogation, and made their way to an “exit” from the virtual world– a land line phone in a quiet subway station. Morpheus exits first, but the group’s antics are witnessed by the only other person in the station, an old homeless man. All humans still connected to the Matrix via the machines’ breeding farms can act as unwitting sleeper agents for its cyber enforcers, so when this unfortunate derelict witnesses Morpheus’ disappearing act, he’s overtaken by Agent Smith. The two lovebirds dawdle for so long that Smith has plenty of time to materialize, get his bearings, and take aim at Trinity, who disappears just in time to avoid the bullet that disables the pay phone. Neo is left alone against his most powerful enemy. The hero contemplates the stairs behind him, but he makes a conscious choice to face Smith head-on rather than make a run for it. Watching at the monitors in reality, Trinity is worried but Morpheus is excited at Neo seemingly ready to embrace his potential. Back in the cyber world, the Wachowskis prep the viewer for the impending clash, overtly using the cinematic language of classic Westerns just as surely as they invoked chop-socky flicks during the training fight: there’s a cheesy musical riff, a dirty newspaper blows across the screen in lieu of a tumbleweed, and mirroring low shots of hero & villain as they stare each other down. Showdown time, pilgrim. Several things are clear early on: Neo is not just better than he was before but also fares even better than Morpheus did against Smith. Smith however is still clearly superior– stronger, faster, and most importantly, being a machine he cannot really feel pain or tire. 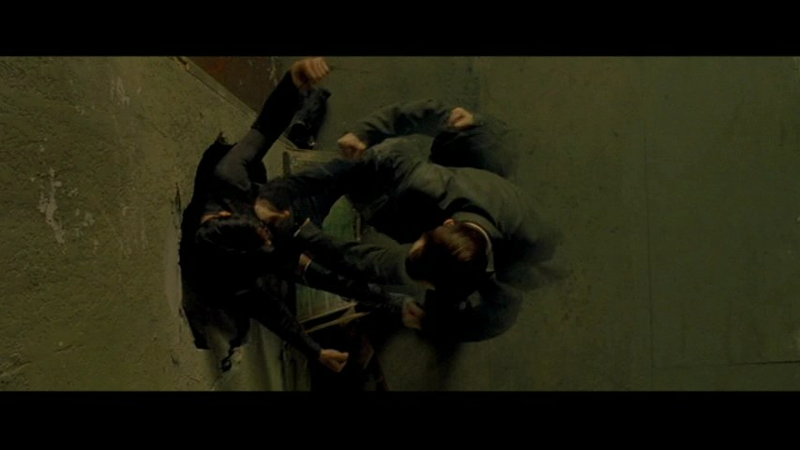 While neither fighter is really “there,” the blows Neo receives are still wearing down his physical body, whereas each hit that lands on Smith merely staggers him briefly. Even without that endurance, Smith’s raw power is tremendous; as with the previous fight we get some intimidating shots of Smith punching holes right through hardened brick & plaster. One especially strong blow sends Neo flying back a dozen feet and landing face first. He coughs up blood in both the real and virtual worlds, but marshals his remaining strength and remains defiant, repeating Morpheus’ cocky little taunting gesture, which actually seems to piss off the machine even more. Neo’s determination is amazing and he presses the frustrated Smith back (his little triple-kick trick actually works this time and he manages to turn a stopped punch into a throat jab), but he is still only human, so Smith is ably to quickly whittle his resistance down. Things get even worse for the hero when he’s pinned against the wall by Smith and pummeled by his 100 mph fists. Neo’s left too weak to fight back, so when Smith hears an approaching subway train he thinks of a sadistic way to finish off the would-be savior, and takes him down to the tracks. Holding him down as the train draws closer, Smith sinisterly lectures “Mister Anderson” about the inevitability of his death. This shoddy treatment inspires the hero to summon up a last surge of strength, which he uses to leap upwards into the ceiling and dislodge himself from Smith’s grip. He then jumps off the tracks just in time to watch the evil program get flattened by the oncoming train. His name is Neo, jerk. Good stuff here. The setting is used well, playing on both the plausible isolation as well as the fortuitous presence of trains as a game-changer. As stated previously the choreography (and the actors’ performances) make the power dynamic abundantly clear, though things are not so lopsided as to be a complete beatdown. You can almost feel Neo growing stronger and inching toward his destiny as the fight unfolds. It’s still not enough to stop his implacable foe, but that only serves to set up satisfaction of the power-reversal of their final showdown. From an entertainment perspective there are limited thrills in watching someone fight a guy who’s basically a brick wall (this fight is certainly less fun and joyful than Neo’s epic sparring session), but it helps that this plays very well into the narrative and character work. Similarly, it’s a little unsatisfying that Neo wins via what’s essentially a cheat. But you can look at it another way and conclude that the hero triumphs through a combination of skill, willpower, and sheer luck; what could be more “human” than that? This entry was posted in Matrix, The and tagged guns, martial arts, one-on-one, sci-fi, The Matrix.